We are hoping that more members will begin to use our web site. Radically improving its look and content are priorities for this year. I will also be writing occasional pieces for the “Commodore’s Corner.” This will either become a reason to go to our web site or to avoid it! I will do my best to convey some information about club activities – some fun, some financial – so that members are well informed about what the Board of Governors is doing on your behalf. In this first column, I want to just say a little about the 2011 Commodore’s Ball. First, Richard Sanger , as our commodore for 2010, had the honor of presenting the Spirit Award. This award is given annually to members who have given extraordinary service – either during that year or over a period of years. This year, the award was given to two couples – John and Pam Loving, and Mary and Gordon Bowie. During 2010, John not only served as fleet captain but Pam essentially served as cruise director and also oversaw getting out all of the club’s Evites. Our huge success with water events in 2010 was directly attributable to their hard work and to the work of all those they recruited to help. Mary and Gordon’s award was akin to a lifetime achievement award! 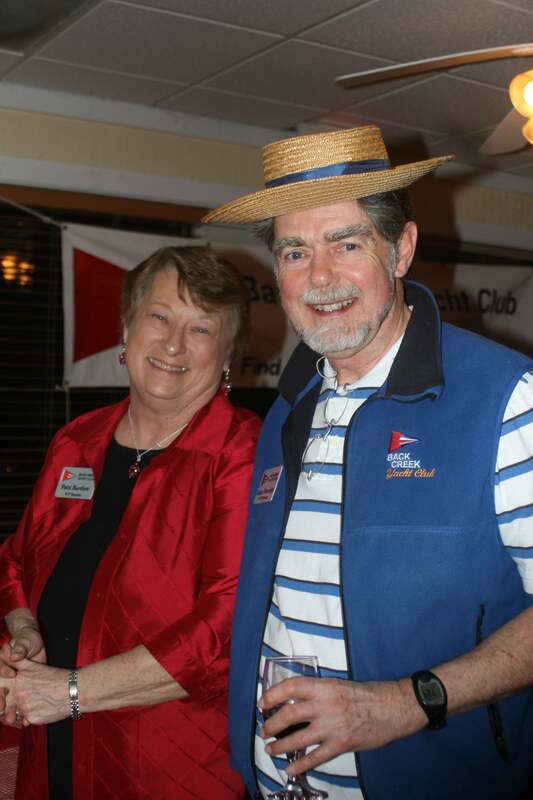 Gordon wrote the “Backyak” club song and Mary has been our treasurer for several years now. The treasurer’s role is mostly behind-the-scenes but it is hugely important. Mary has been a wonderful steward of our money and how it is spent. The Lovings and the Bowies -- truly deserving recipients of the BCYC Spirit Award. Second, I presented Linda Sole with a gift to thank her for all of her hard work on the Commodore’s Ball. For the past 3 years, Linda has organized this fabulous annual event (usually with Juliana’s help). This year was no exception. The food, the venue, the fantastic candelabras with boats that she made on their bases, and the incredible music (we’ve booked the band already for next year) led to a memorable event. Third, Richard Sanger ended his term as commodore. Serving in this role may be much like what some people say about buying a boat: The two happiest moments in a person’s life, buying a boat and selling it! Or in this case, becoming the commodore and then giving it up!! We all owe Richard a big “thank you.” On his watch, the club had one heck of a year – not only with great events but also raising funds and presenting a check to the Chesapeake Bay Foundation. In amongst having a lot of fun, the BOG had its first meeting of 2011 and got down to some of the club’s business. I will report on that in next month’s “Commodore’s Corner.” I may also say something then about my wrestling with a theme for this year. Since I’m a sociologist, I’m drawn to JohnO’s “It’s all about the people.” But historically, the club’s slogan has been “Up the creek.” I could do a bit of morphing with these and have “It’s all about the creek” or “Up the people.” I think we are more than just ‘about the creek’ and ‘Up the people’ sounds like a political bumper sticker! I think JohnO is right: it is “all about the people.” I’m glad to be one of you – “Up the creek” or not! TGIF – “Thank God it’s February”! Only one more month to go and boating season on the Chesapeake Bay will be upon us. For us lucky BakYakkers, February has also brought “Italian Night” and a happy hour at Dale and Betsy’s. Winter will soon be behind us – I hope! In this installment of the “Commodore’s Corner”, I want to tell you a little about the business of running the club. While we are “virtual”, we are still very much a business – with income and expenses. In December, our treasurer, Mary Bowie, sent me a note expressing concern that many members felt that we were essentially “rich”, with lots of money in the bank. I spoke with Richard Sanger (still Commodore then) about this and we looked with care at the budget proposed for 2011 compared to the 2010 budget. We knew that 2011 was going to bring 2 big budgetary changes: the new cost of $200 a month for a webmaster and the loss of about $2000 in income from cancelling the silent auction as part of the Commodore’s Ball. To accommodate our new expense and offset our new loss of income, something had to be done. 1. The club has never before had a formally stated finance policy. After a unanimous vote by the BOG, it now does. Our policy is essentially this: that we will always maintain a reserve equal to one year’s operating expenses, to be there for emergencies. On an annualized basis, we will do our best to break even with income and expenses roughly equal to one another. 2. This philosophy is further laid out in the Finance Report. There, some new operating principles will be found; key among them is that we will counsel and work with anyone responsible for organizing/hosting an event in an attempt to get expenses equal to income. We will also monitor this throughout the year and adjust it as necessary: increasing fees slightly to offset prior losses or reducing them slightly if a “profit” has accrued. 3. We are also exploring very conservative investments for our reserve, possibly laddered CDs. The BOG felt strongly that we needed to maintain our reserve for any unforeseen liabilities, to include legal costs which might not be covered by the liability policy which presently covers the BOG. I want to thank Mary and her committee for their hard work on our behalf. Our policy statement and commitment to fiscal stewardship will serve us all well. Much of what I have just reported covers the expense side of the ledger. What about the income side? To offset the loss of income from the silent auction, the BOG is exploring a variety of options. The likeliest will be occasional 50/50 raffles held at the largest club events throughout the year – e.g., the season kick-off event in April; the lobster feast; and the annual meeting among other possibilities. In short form, we are very mindful of the need to generate some additional income and are confident that we will do so. At present, our budget shows us anticipating an $1800 deficit. We believe that this is unlikely to actually occur. March Madness? March comes in like a lion and goes out like a lamb? April showers bring May flowers? Well, given the cold winter and wet spring we have had, I’m still waiting for the “lamb” and in light of rain, rain, rain, I’ve had my own form of ‘March Madness’ . Alas, it should be one hell of a display of flowers in May! In the meantime, no matter what the weather, spring is upon us. It’s definitely a time of rebirth and renewal – farmers and gardeners till and plant; Chesapeake Bay boaters apply bottom paint, new zincs, wash and wax, refit their sails, de-winterize their engines, test out the air conditioning, and generally get ready to be back on the water. At last!! For BCYC, this will all start on April 16 with the season kick-off event, an opportunity to have a blessing of the fleet and to recognize and formally welcome new members. It is our own spring renewal, springing forth from our various locales to see one another again. Gail and Bob Higginbotham have once more made their home available to us for this annual celebration. It’s an exciting time for us since it is the official (by our standard) start to months of on-the-water events. You will soon be receiving information about a mid-May raft-up, the Memorial Day cruise, and the season’s big event, our annual cruise. So go get that “pink stuff” out of your engines! Reattach those hoses and start washing! Fire up those buffers and start waxing! To paraphrase from “Camelot”: “It’s here. It’s here. That shocking time of year.” It may not be “the lusty month of May” but it’s definitely time to get back on the water!